Emerald Isle vacationers don’t have to venture too far to discover an entirely different coastal environment via the community’s newest park, Emerald Isle Woods Park. Located just off of Coast Guard Road, and only a few blocks away from the bridge to the beach, this quiet soundside park is a haven for hikers, birdwatchers, and explorers who want to enjoy a natural slice of the Crystal Coast shoreline. The 41-acre park features a host of amenities to attract nature fans and water lovers alike, and also boasts a number of handicapped-accessible features. There are a series of walking and hiking trails that lead to the waterfront and through the heart of the maritime forest, as well as a floating dock for easy paddle board or kayak adventures. A small pier is located on-site for anglers who want to cast a line, and there’s even a picnic pavilion with four grills and restrooms located nearby. Designated as part of the North Carolina Birding Trail, the park is an especially popular spot with nature fans who can expect to see dozens of local or migrating species depending on the time of year. 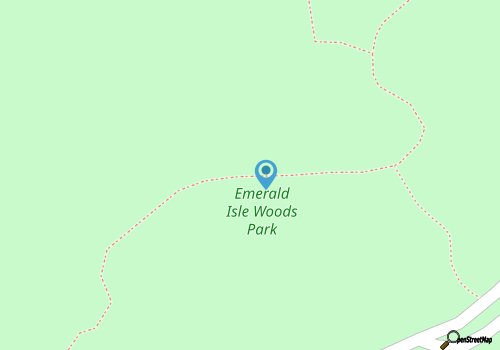 A breath of fresh salt air that feels worlds away from the ocean shoreline environment, Emerald Isle Woods Park is a prime destination for outside-the-box outdoor fun.